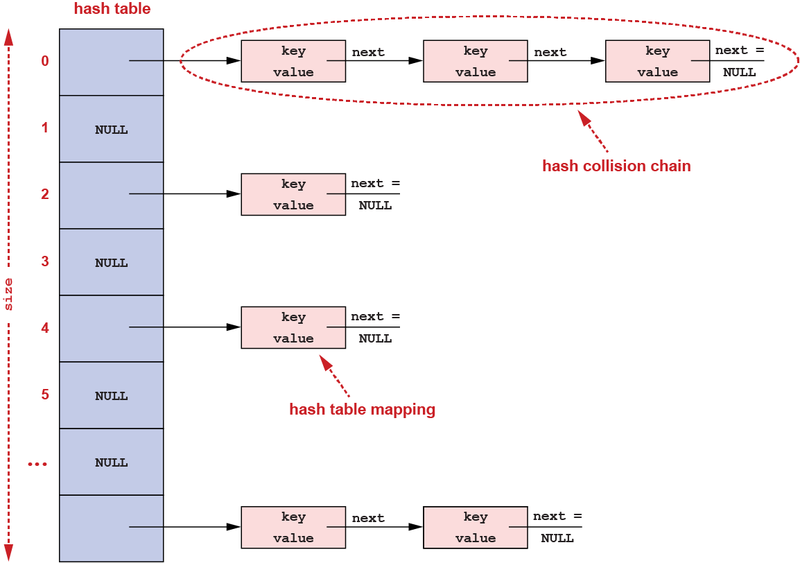 Learn about hash tables and how they are used. Practice working with linked lists and dynamic memory allocation by implementing a hash table in C.
Learn about function pointers in C.
To obtain your private repo for this lab, please point your browser to this starting link. A hash table is an efficient data structure for maintaining a collection of "key"-to-"value" mappings. The operations supported by a hash table typically include: insert a "key"-to-"value" mapping into the collection, lookup a mapping with the specified "key", and remove a mapping with the specified "key". A hash table is also sometimes referred to as a Hash Map (as in Java) or a Dictionary (as in Python). An ordinary array can be used to implement a collection of "key"-to-"value" mappings. A simple function can be used to compute a unique array index from a given key, and the associated value can be stored at that location within the array. Generally speaking, this approach is easily implemented and the operations, insert, lookup, and remove, run very quickly. However, this approach has a major drawback. The size of the array has to be equal to the number of possible keys. In most cases, it is just not feasible to allocate such a huge array. Moreover, even if it is possible to allocate an array of that size, since the number of keys which are actually in use is usually much smaller, the array is very inefficiently used. For example, suppose that an array is used to store something using each of the words in a dictionary as keys. Then, the array size has to be big enough to accommodate all possible combinations of characters for some maximum word length. However, only a fraction of character combinations are valid words, and the rest of the space in the array is wasted. A hash table eliminates the wasted memory of this strawman approach without sacrificing much in simplicity or speed. A hash table also uses a function, called a hash function, that computes an array index from a given key and stores the corresponding value at that location within the array. But, unlike the functions used in the case of an ordinary array, a hash function doesn't need to compute a unique array index for every possible key. Instead, a hash table allows more than one key to use the same location within the array. When this happens, it is called a collision. One approach to handling collisions is to create a linked list of all the mappings that collide. This is called chaining. Clearly, collisions are unavoidable when the number of mappings stored in a hash table is greater than the size of the hash table's array. In general, if the array size is never changed, as the number of stored mappings increases, so will the number of collisions and the average length of the collision chain linked lists. Adding a new mapping to the hash table is unaffected because it just involves computing the array index from the key using the hash function and adding the mapping at the front of the linked list. However, longer linked lists will result in lookup and remove operations taking longer. Therefore, a hash table can be made to dynamically grow (or shrink) the size of the array in proportion to the number of stored mappings. This approach maintains the average length of the linked lists below a desired threshold called the load factor. Given a hash table array of length m that stores n mappings, the load factor is defined as n/m. Given a key k and a hash function h, the associated value for key k is stored in the index h(k) within the hash table's array. A good hash function generally maps the keys uniformly across the range of array indices and thereby generally keeps collisions to a minimum. For some uses, the set of keys that will be encountered may already naturally have an approximately uniform distribution, but in many uses, this is not the case. For example, for the set of words in English, many more words start with an 'a' than with an 'x', etc. Below is the hash function used in this lab. It takes a string as its argument and returns an unsigned integer as the hash value for that key. *  Computes the Fowler / Noll / Vo (FNV) hash of the string "key". * to change the least significant 8 bits of "hval". Clearly, this function can return values that are much larger than the array size of most hash tables. Thus, the hash table actually uses as the array index the remainder after dividing the resulting hash value by the array size (i.e., array index = hash value modulo array size). The parentheses here act just like parentheses in any expression, causing this part to be "evaluated" first. That means you should read this part of the type first, reading it as: "pointer to". Of the two remaining parts of this type, this part, ( ... ), has higher precedence than the other part, void * (just like multiplication has higher precedence than addition). So read this part before the last part, reading this part (simplifying here) as: "function taking these arguments". Finally, read this part as: "and returning pointer to void. A good resource for helping with this is https://cdecl.org/. In effect, if destructor is a pointer to the function, then *destructor "is" the function (not just the pointer), and the parentheses around this part of the expression cause it to be evaluated before the rest of the expression (i.e., the actual calling of the function). Below is the interface for the hash table that you'll be working with in this lab. This interface is contained in the header file hash_table.h. This interface definition also illustrates how the principle of "data hiding" (also known as "information hiding") can be realized in C. In particular, the implementation details of the hash table are hidden from its callers, and the hash table doesn't need to know how the memory was allocated for the keys and values that it stores. The hash table also allows a user-defined cookie to be passed among functions. The cookie is a void pointer, allowing you to pass a pointer to any type of data you wish. This enables you to provide additional data when removing items from the hash table and/or iterating over the hash table. You will see one example of how to use such user data in next week's lab. * data structure for maintaining a collection of "key"-to-"value" mappings. *  "load_factor" must be greater than zero. *  was successfully created and NULL if it was not. *  mapping's key, its value, and the latest value of the pointer "cookie"
*  defined. Returns "cookie"'s latest value. *  "key" is not already in "ht". *  "value" is not NULL. *  created and -1 if it was not. *  The order in which the mappings are passed to "function" is not defined. *  Returns "cookie"'s latest value. *  returns its associated value. Otherwise, returns NULL. Before you begin the exercises for the lab this week, we'll discuss the data structures that you'll be working with. The file hash_table.c contains the following data structure definitions. *  is called a collision chain. * The "key" is a pointer to a string. * The pointer to the next element in the same collision chain. *  the hash table contains. * The number of collision chains. * The number of mappings in the hash table. * allowed before the number of collision chains is increased. The file hash_table.c contains the following function for initializing a hash table. We are showing you this function as an example of the use of calloc() to allocate and initialize memory. * every collision chain to NULL. * to report the spelling errors in each of the documents. Loaded 14 words from the dictionary "small_dictionary". and to then print all of the words in the dictionary (by iterating over the hash table). Every word is in the dictionary. Processed 14 words from the document "small_dictionary". This command tells spell_check to use the dictionary small_dictionary and to then check the spelling for all of the words in the file small_dictionary. Loaded 479828 words from the dictionary "/usr/share/dict/words". Processed 479828 words from the document "/usr/share/dict/words". Be sure to git push your lab before 11:55PM on Saturday at the end of this week.